May 26. 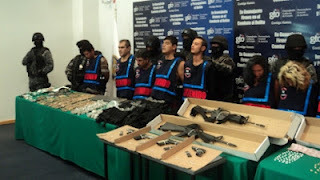 The Attorney General of the state of Guanajuato, Mexico, Carlos Zamarripa Aguirre, has paraded before the press fifteen alleged cartel members arrested in twelve raids. The raids were conducted in León, Purisima, Yuriria and San Francisco del Rincón. 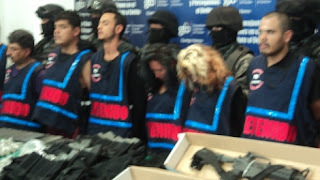 The arrested are allegedly members of two different cartels: ten from "Cártel de Jalisco Nueva Generación " (Jalisco New Generation, or CJNG), and five from "La Familia Michoacana" (The Michoacan Family), possibly including also members of the rival off-shoot "Los Caballeros Templarios" (The Knights Templar). 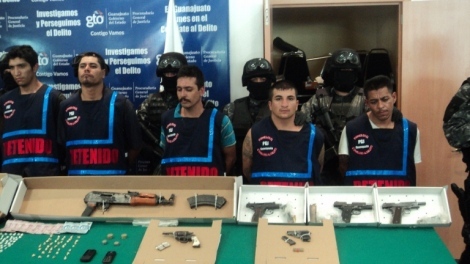 Zamarripa confirmed that the arrests related to a cartel dispute over the León territory or “plaza”, and that they involved at least twelve recent crimes, including several kidnappings. The Attorney General further stated that members of the CJNG are likely responsible for the murder of two members of Matehuala Rangel family in the Villa Insurgentes neighbourhood of León. 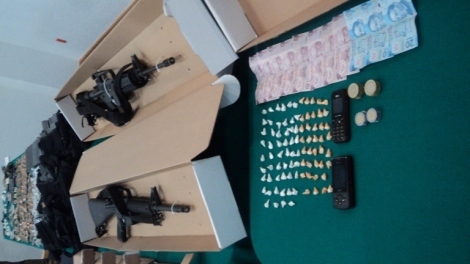 In the presentation to the media, the official showed off the weapons, drugs, and vehicles confiscated from within the twelve safe houses of the two criminal groups. 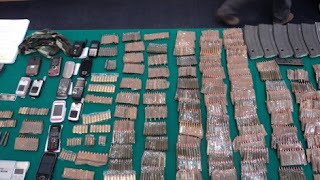 These included nine weapons – including pistols and high-powered rifles – over 1,000 cartridges, cocaine, crystal and “rock” methedrine, marijuana, scales for weighing drugs, tactical gear, police uniforms, and radios and cell phones. The take also included six vehicles. Zamarripa also explained that the arrests solved an un-named crime committed by Roberto Alvizu Montaña, aged 50, which occurred in the Buenavista neighbourhood in León. 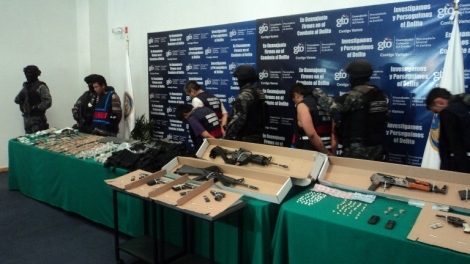 The detainees, which came from Chiapas, Michoacán, Chihuahua y Durango, are being held by authorities for a wide range of crimes, including the kidnapping of two businessmen from the southern municipalities of Guanajuato, both of whom were murdered. Included among the fifteen detained are the cell leaders, two women, and one minor under 16 years of age. Zamarripa explained that officials were highly motivated to make arrests after five youths were executed in a single night in the city of León. Co-operating law enforcement agencies determined the identity of the rival groups vying for control of the plaza. During the raids one person was shot and killed: Teodoro Reyes López, aged 62, originally from the southern state of Chiapas. 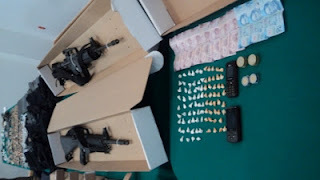 One of the detainees, Óscar Omar Ortiz Osornio, also known as "El Bikur", was identified by authorities as an extortionist implicated in four kidnappings and two deaths: a merchant and a woman found in a shallow grave near Valle de Santiago, Guanajuato.